I’m never ready for summer to end, but once the kids return to school and we settle back into our school year routine and activities, I start to plan out to some fall activities. I thought these fall scavenger hunts would help get us excited about some of our favorite fall traditions as we sadly watch our local pool close for the season. Our summer scavenger hunts were widely popular and many asked if there would be fall scavenger hunts. Our kids were asking too. They love, love, love scavenger hunts and I know many of yours do as well. Scavenger hunts a great way to ge kids engaged in an activity and exploring the world around them. They can also be used to extend an activity for later. 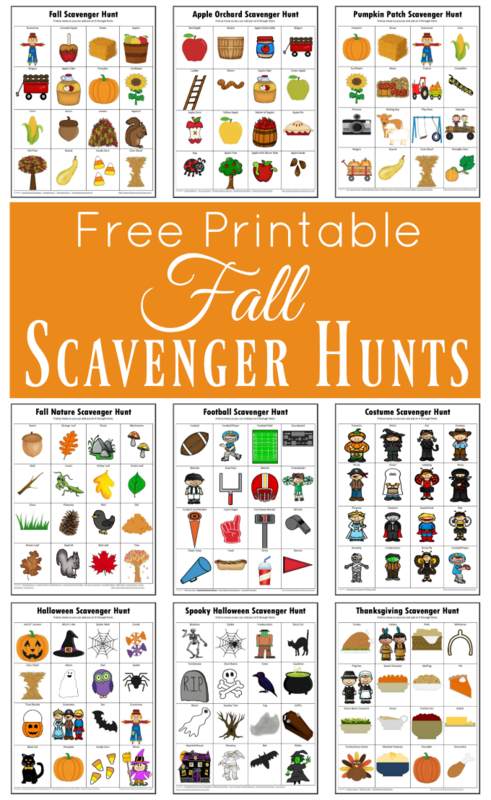 The first up is a general Fall Scavenger Hunt. It includes many fall favorites from apples to leaves to pumpkins. One of our first family fall activities each year is a visit to our local apple orchard. We pick a ton of apples to snack on for the coming months or to make caramel apples, a family favorite. The Apple Orchard Scavenger Hunt will be a great addition to our visit. The pumpkin patch is also a favorite fall destination. The Pumpkin Patch Scavenger Hunt will be a fun way to check off all we see and do at the pumpkin patch. We are not die-hard football fans, but we do enjoy attending our local high school games. This Football Scavenger Hunt will be great for entertaining little ones during a game, whether you are at the game or at home watching the game on your television. There is so much going on in nature during the fall from the changing of leaves to squirrels gathering nuts for winter to birds migrating. This Fall Nature Scavenger Hunt helps kids identify and observe what is happening in nature all around them during the fall. This Halloween Costume Scavenger Hunt would be great to take along while costume shopping for a fun activity or for a costume party. I have always preferred a not so spooky Halloween like what you will find in this Halloween Scavenger Hunt, but as my kids have gotten older they like it to be a little more creepy like this Spooky Halloween Scavenger Hunt. 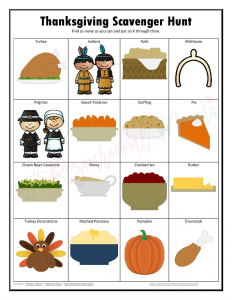 This Thanksgiving Scavenger Hunt is a great way to keep kids entertained on Thanksgiving while you are preparing the meal. Be sure to check out summer scavenger hunts. There are a few that would work great for fall as well. Themes included with the summer scavenger hunts are: beach, camping, nature, zoo, swimming pool, amusement park, yard, barbecue, and park. If your kids are not back in school yet, this School Supplies Scavenger Hunt is fun for kids as they get ready to return to school. Subscribe to our newsletter and be the first to know when we publish our Winter Scavenger Hunts! This Orchard Scavenger hunt looks perfect. Thanks for making all the fall options. This pictures make if fun for everyone. I am thinking a match game is in the near future for these too. I’m so glad you like it Amy! Your Apple Date Planner has lots of fun and yummy items! Thanks. I am having fun putting them together.